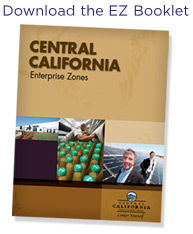 The California Central Valley Economic Development Corporation (CCVEDC) is a regional marketing group whose mission is to promote job creation in the eight counties of the San Joaquin Valley. CCVEDC provides businesses with the resources necessary when evaluating, planning and implementing a site location/expansion in the region. The CCVEDC Board of Directors comprises representatives from each of the eight EDCs in the San Joaquin Valley, along with a representative from Pacific Gas & Electric.